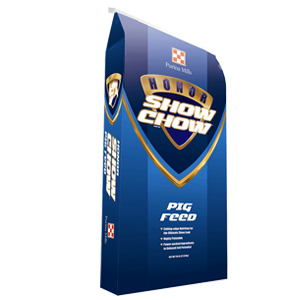 Feed to continuously to show pigs from 150 lbs to show. Caution: DO NOT FEED TO SHEEP DUE TO HIGH LEVELS OF COPPER. Special Considerations: Protect from excessive temperatures (temperatures that exceed 40 degrees C or 104 degrees F) Do not store at warm temperatures up to 104 degrees F (40 degrees C) for more than 7 days.